The medical profession is always rolling out new designs for their staff. Here in the UK, I regularly see hospital doctors and nurses in uniforms which are newly-styled regularly. Of course when one goes into the job of practising medicine, he/she does so with the understanding that the uniform will never be ultra modern or stylish. This of course, is the last thing on their minds, I'm sure. After all, when you go into medicine, you do so to help others, not to be the height of fashion, right? Having said that, I remember years ago, the scrubs seemed to have been made for very short, fat and square people. Anyone wearing one, whether they were attractive or not, was transformed into a square figure of cotton. 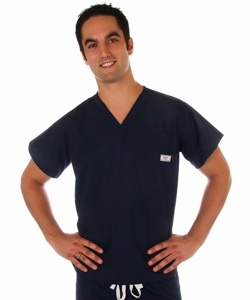 Nowadays the trend seems to be moving towards more fitted and stylish scrubs, (like the one above) rather than the former. I like to know that my doctor or nurse is capable of helping me, but I don't mind them looking great at the same time too. How about you?